Information on the book and educational material. For PDA/ CEU: Pacific College of Oriental Medicine (46 CEUs): For details and registration. Read the introduction and excerpt (PDF). 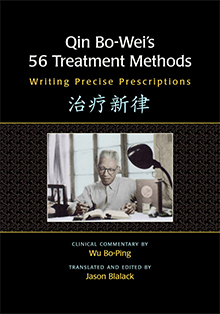 Read Qin Bowei’s 56 Methods: A Clinical Perspective. An article describing the boo’s history, usefulness of viewing things through the lens of treatment methods (principles), and clinical examples. This book can be purchased from Eastland Press. “There is nothing else available in the English language literature that I know of that comes even close and this information alone makes the book a “must buy” for any serious practitioner. Add to this the clinical experience of two master physicians, the clarity with which Jason Blalack makes that experience accessible, and the immediate translatability of what is discussed to virtually any situation one might encounter in clinical practice and it becomes an absolute bargain.” For the full book review see RCHM (Register of Chinese Herbal Medicine) (UK) (Spring 2012). This wonderful book presents in an easy to understand fashion the ideas of Qin Bo-Wei, one of the most important practitioners of Chinese medicine in the 20th century. As a teacher of Chinese herbs for over ten years I highly recommend this book to anyone wishing to deepen their knowledge of herbal medicine and apply the principles presented in this book in their clinical practice. It’s a must read for students and experienced practicing herbalists alike. I want to offer a very sincere thanks for your dedicated work on the new book. The introduction alone made me feel like I (and so many others) had been heard, that treatment methods offered during coursework can sometimes feel needlessly frustrating to navigate – for a host of both good and “bad” reasons. The book has so many of the things I wish I’d had before now. The Q&A sections are a particular favorite. I can’t count the number of hazy responses I received to some of these very questions in my own training. Otherwise: it’s concise without holes and never feels pithy; it’s visually easy to absorb (so vital); and it has a beautifully considered index to boot (why books on all manner of subjects ignore this art, I’ll never know). I won’t spill over here, but truly, a gift.